Susannah receives £10,000 personal development grant. City University London's Professor Susannah Quinsee (pictured) has received the UK's most prestigious prize for excellence in higher education support for student learning - the National Teaching Fellowship. Professor Quinsee, who is Director of Learning Development at the University, was presented with £10,000 to be used for her professional development in enhancing learning support for students at a ceremony in London on 5th October 2011. Professor Quinsee leads the Learning Development Centre (LDC) at City. This shares good practice and provides expertise in educational excellence throughout the University. With her considerable experience of online learning, student support, implementing learning and teaching strategies and change management, one of Professor Quinsee's most impressive achievements is the creation of the Strategic Learning Environment initiative at City, which has brought significant benefits to both students and academic staff. Professor Quinsee's research focuses on leadership and change management in relation to learning development, developing communities of good practice in higher education and engaging colleagues in new learning and teaching methodologies, especially how technology can enhance the students' learning environment. City University London's Vice-Chancellor, Professor Paul Curran commented: "Susannah's award of the National Teaching Fellowship is richly deserved and I am delighted for her. Through her commitment and expertise she has inspired countless academic colleagues to even greater heights of educational achievement here at City". Professor Susannah Quinsee commented: "The National Teaching Fellowship is a great honour and the funding that comes with it, together with the encouragement and support I receive at City, mean that I will be able to continue to translate my research findings into good practice to share with academic colleagues and continue to support educational excellence". The Higher Education Academy (HEA) administers the National Teaching Fellowships Scheme as part of a programme to inspire and celebrate teacher excellence. Professor Craig Mahoney is the HEA's Chief Executive. He commented: "The dedication of the 55 new Fellows announced today is to be applauded and provides further evidence of the high quality innovative practices that students paying fees will increasingly expect to experience in higher education". 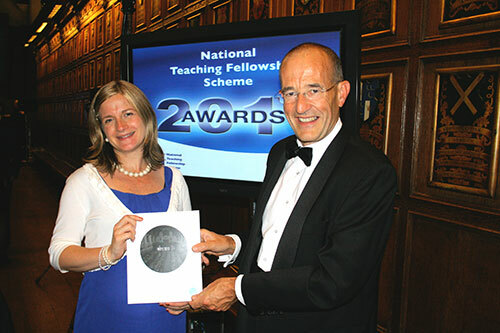 Professor Quinsee is the fifth member of academic staff at the University to become a National Teaching Fellow. Previous winners are: Professor Jason Dykes (2006) from the School of Informatics, Professor Nigel Duncan (2004) from the City Law School, Professor Clive Holtham (2001) from the Cass Business School and Professor Maggie Nicol (2000) (now retired) from the School of Health Sciences.